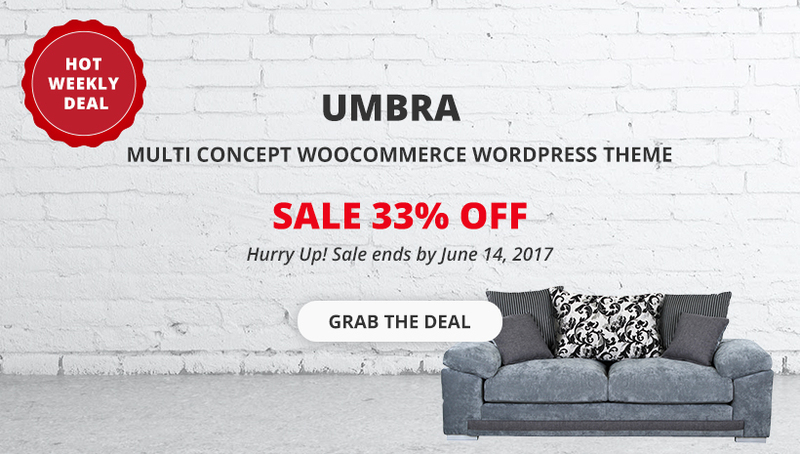 NooTheme / Announcement / Hot Weekly Deal – Up To 33% OFF Umbra is offering! Hot Weekly Deal – Up To 33% OFF Umbra is offering! Everything you need to build up a professional online shop, Umbra absolutely cares all with great functions, powerful integrations, and dedicated support. the theme can be suitable for any kind of e-commerce shops thanks to its multi-functional layout, including Interior & Furniture, Fashion, Bags, Shoes, Accessories, etc. Hence, Umbra dedicates a so beautiful look for your online shop for any concept, you know. Sending you a hot deal in this week for new updates – Up to 33% Off, Umbra loves to get more friends and supports you more on running a successful business. Be Quick! You can save up to $20 just in a week. The deal ends on June 14, 2017. New updates Umbra has just made. – [FIX] WooCommerce outdated file template. – [FIX] Missing language file. – [FIX] Other styling issues fixed. We just want to affirm that, we are trying to make Umbra be as good as possible with non-stop improvements. Let’s take a tour on Umbra again, and you will feel how beautiful it is!